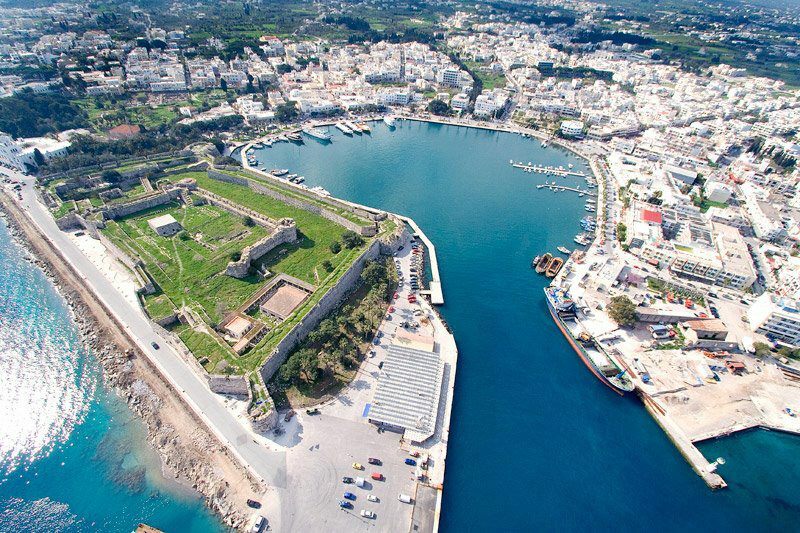 The “Neratzia Castle” It is situated in the entrance of the Kos harbour on a place where, in antiquity, there was an island, communicating with the inland through a brigde, that one sees even today (The bridge of the Phoenicians’ street). It is formed of two defensive precincts. The interior one has four circular Towers in the corners; the southeastern Tower forms part of the exterior precinct, which is larger than the first, with massive bastions on the four corners, battlements and gunports. The two precincts are separated by a large moat and communicate with a drawbridge. The castle was built of local stone as well as parts of ancient buildings (columns, architraves, bases etc.) from the ruins of the ancient city. On the upper part of its masorry, one can see many blazons. Over the main gate’ s one sees an hellenistic frieze with masks and garlands. On the gates ceiling (central gate, Carmadino gate) there are basalt columns placed obliquely, which come probably from the early christian basilica of Limen. The Asckepeion of Kos Situated 4 km west of Kos, Asklepeio is the most significant archaeological site on the island. The excavations here began in 1902, by Iakovos Zaraftis from Kos and Hertsok from Germany. Asklepeio was built in a green area full of cypress trees. During the ancient years, it served as a sanatorium and it was dedicated to Aesculapius, son of Apollo, protector of health and medicine. Many significant people taught and worked here, one of them being the father of Medicine, Hippokrates. Due to the steep ground, Asklepeio consist of four connecting levels, called “andira”. The first is characterized by ruins of Roman constructions of the 1st century AD. The second, where the medical school is said to have been housed, is known for its arches and statues. The spas were here and they were watered from the spring of King Halkon and the spring of Vournika on Mount Dikeo. The third level is where the Temple of Aesculapius of Kiparissios Apollo (4th century BC) used to be. Excavations in the surrounding area brought to light an invaluable treasury for visitor’s offerings, a semi-circular platform and a small Roman temple dedicated to Neron. The fourth level was constructed in the 2nd century BC and included a large temple of Doric style along with the chambers of the patients.